At our studio we are Earth Happy. We strive to ReDuce-ReUse-ReCycle-UpCycle in the production of all of our projects. 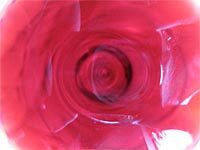 We specialize in Upcycled Furniture, Interior Visual Decor, & Vintage and Upcycled Jewelry. Participatory Comedy Murder Mystery presented with a 4-course dinner and wine in St. Louis' oldest home. Show times Friday and Saturday at 7:00 pm, Sunday at 2:00 pm. Since the audience participates in the show, some guests will have lines to say and you can tell us if you would like a "starring" role or not. The level of participation is up to you. Make your reservations now; it would be a CRIME to miss out on this much fun! Located in the heart of Saint Louis, in the Central West End neighborhood and on the edge of Forest Park, The Chase Park Plaza is a luxury hotel and residence with a five-screen movie theater, four restaurants, state of the art fitness facility and salon & spa. We sell 50's products. Mostly bowling shirts and other decorated apparel. We also sell poodle skirts, letter sweaters and other fun fads and fashions from the 50's. 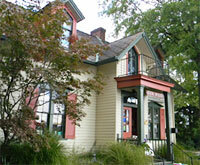 We are the oldest and largest used bookstore in St. Louis. We have over 200,000 books on 3 floors. 2171 S. Big Bend Blvd. Local, fresh, organic ingredients made from scratch on site. The Italian fare is incredible with a special menu that is the best in town! I hand fold fabric Kanzashi flower accessories, jewelry, and art. 75% of the fabrics and buttons I use are upcycled, repurposed, or vintage. The St. Louis Curio Shoppe sells and consigns locally-made goods from local businesses, non-profits, young entrepreneurs, authors, musicians, filmmakers, artisans and artists who are within a 50 mile radius of St. Louis, MO. We strive to celebrate all that is St. Louis by actively supporting our community through fundraising events, promoting local businesses and sharing our city's unique history through displays and events. From our books, music, films, memorabilia and household products, to our fine art, jewelry, gifts and curiosities... Everything is 100% St. Louis! St. Louis Transitions is the publisher of two Route 66 St. Louis books, a cookbook entitled The Route 66 St. Louis Cookbook: The Mother Lode of Recipes from the Mother Road and a history book entitled, Route 66 St. Louis: From the Bridges to the Diamonds. We also sell handmade Route 66 and retro items. Most of our retro items are food/diner or transportation/car related. Our handmade items include aprons for men, women and children, kitchen towels, placemats and table scarves, oven mitts, potholders, hair accessories, do rags, tote bags, jewelry including a popular Route 66 charm bracelet, Route 66 Christmas ornaments and stockings,and even tissue holders and bookmarks. We sell Route 66 posters, magnets and a limited edition set of Route 66 St. Louis Landmarks art prints. We will accept custom orders if a customer is not in a hurry for an item. Saint Louis' Online marketplace to buy and sell furniture. St. Louis-inspired apparel and merchandise, custom screen printiing, promotional products and graphic design services. New, used, rare and unusual books. Large collection of books on Missouri and St. Louis history, travel, Route 66 and surrounding areas. Located on the Original Route 66 - Manchester Rd, in historic Victorian house built in 1863. Post-consumer craft and art supplies at pay-as-you-wish pricing. Custom tshirt screenprinting from a local source! Fun, Independent, Eco-Friendly, and Easy to work with. Lots of styles and brands, free local delivery, no hidden fees. 8 1/2 South Euclid Ave. Lodging Facility. Motel Room rental. 650 N New Florissant Rd. 34 S Old Orchard Ave. 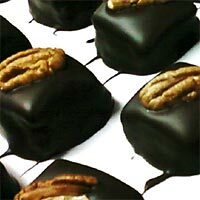 All-natural hand-dipped chocolates and confections, including chocolate truffles, sea salt caramels, milk and dark chocolate bark, marshmallow pies, brittles, and more. Welcome! 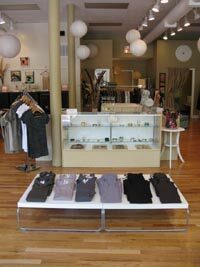 Mezzanine features clothing, jewelry, shoes, and accessories from established and emerging designers. A true boutique, Mezzanine has a perfectly edited collection that transcends trends while staying on the cutting edge of fashion. Tasteful and unique, this streamlined store in historic downtown Maplewood, Missouri is sure to please even the most discerning shopper. 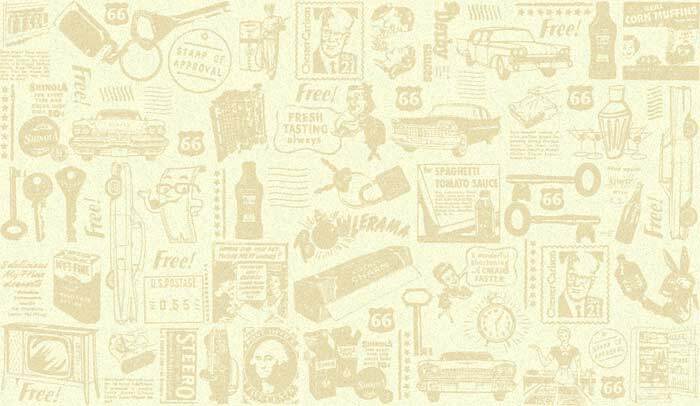 Online store featuring original rubber stamps designed by Carolyn Hasenfratz, including several Route 66 themed designs. The store also features a variety of art and craft supplies including rubber stamp ink, rubber stamping accessories, mounting supplies, embossing powder, jewelry findings, fabric decorating paints and dyes and more. 37 S. Old Orchard Ave.
27 S Old Orchard Ave.
We Bring out the STAR in Kids! Providers of Parties and Entertainment for all Occasions. Educational Enrichment programs, Assemblies and Field Trips, Workshops and Fun for Aspiring Magicians of all ages. We are an Anime (Japanese Animation) themed store. 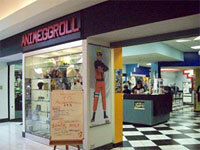 We carry DVD, manga, t-shirts, key chains, bento boxes, plush, jewelry and more related to the Japanese pop culture. Art Coop is a co-op showing and selling art work by local artists. Selling gently used upscale furniture and home decor to benefit charities. We are a retail botique with clothing accessories: We import Pashmina Shawls (true Pashmina and Pashmina-style shawls), scarves, and other silk products; We also have hand-made jewelry, particularly a crocheted line of beautiful necklaces and matching earrings and bracelets; vogue costume jewelry at great prices; and one-of-a-kind botique clothing items. Outstanding collection of Mid-Century, Retro & Vintage furniture, home accessories, clothing & jewelry. 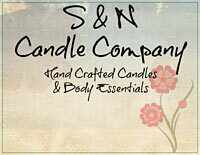 We are a small shop on Route 66 in Crestwood MO that does hand crafted soy candles, natural soaps, lotions, lip balms and other body essentials. We are family owned art studio, gallery and custom frame shop. We have art classes for ages 6 to adult in oil, acrylic, watercolor drawing and much more. We have open studio nights and a draw club. We have workshops and a new scrapbooking club that is coming soon. Our custom framing area offers a large selection and high quality work at a price to meet any budget. We also sell a lot of art supplies and anything we don't have we can get for you and always at comparable or lower than name brand art stores with the same products. Welcome to Retro Rescue & Resale, LLC, the best way to buy retro, vintage, antique and upcycled, furniture, home deor, vintage and handmade jewelry as well as one of a kind artwork and collectables. Shop our beautiful collection of Mid-Century Modern furniture, specialty upcycled furniture items, as well as completely cool home accessories. We also offer retro wall deor, lighting, and many collectables. Family owned and operated, Hardware, Lawn & Garden, Local products, Fishing and Hunting store. 568 Old Smizer Mill Rd. We sell assorted flavors of pies. Everything from Sweet to Savory: Fruit, Sugar Free Fruit, Cream, Breakfast, Lunch and Dinner. Yes everything is in a PIE! It is a Savor and Sweet Southern Fried Treat! We are a 40 year old business publishing a regional Missouri monthly outdoors newspaper. 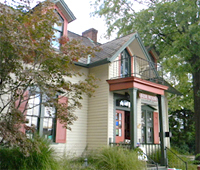 We also are a specialty bookshop carrying local and regional authors on fishing, hunting, Missouri history, Ozark Trail and other outdoor pursuits.We are located in the old Johnson's Mo-Tel, a giraffestone building, in St. Clair, Missouri. Provide law enforcement continuing education and teach firearms safety courses to civilians (for concealed carry permit requirements). Boots, Jeans, Moccasins, 66 T-shirts. We are an eclectic mix of everything. Working out of a remodeled 1920's gas station on Route 66, we carry Route 66 merchandise, handmade local art, garden and home decor, jewelry and more. Motel and Connie's Gift Shoppe. 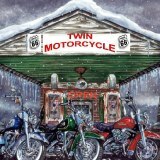 We sell gifts, Route 66 memorabilia, decor and more. 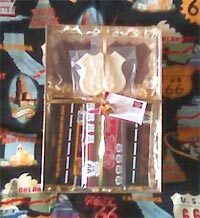 Route 66 Signature Candy Bars, Fudge and custom chocolates. We also wholesale to other Route 66 Businesses. The St. James Chamber of Commerce & Tourist Center, located at Exit 195 on I-44, gladly welcomes thousands of visitors each year. Staff will send visitor packets upon request, as well as provide assistance in scheduling agendas for individuals or tour groups. 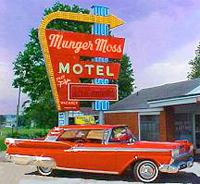 Route 66 memorabilia, such as t-shirts, ball caps, soup mugs, magnets, and postcards are available for purchase. Locally handcrafted items including quilts, jewelry, birdhouses, and walking sticks are on display for buying as well. Snacks and drinks are offered at a reasonable rate. A paved walking trail is available for exercize, and restrooms are ADA compliant. 8 buildings of indoor shopping plus a lunch deli! We sell antiques, gifts, home decor, collectibles, fabrics, quilts, Made in Missouri, and so much more. We are a Shell C Store/Onestop liquor store. We are interested in selling your products for travelers. 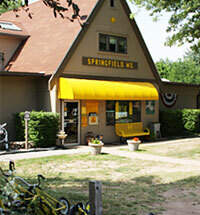 Gifts, Collectibles, Souvenirs, Largest selection of Route 66 Merchandise in the Ozarks, Made in Missouri Products. Rent rooms to travelers of the Road. Have rooms with one or two beds, smoking and non. Have a gift shop with Route 66 memorabilia. Route 66 Thrift & Gift has a large assortment of Route 66 jewelry, some metal signage and a vast assortment of other items. American Indian inspired wrap bracelets/necklace/anklet... gypsy bracelets, beaded necklaces and different woven bracelets. We specialize in Gourmet Italian Ice Cream but we are not limited in what we offer. We also have 100% fresh fruit Smoothies and deserts. This will be a unique experience in Route 66. We sell antiques, collectables, used furniture, retro, vintage, books, tools, primitives, signs, coins, you name it we may have it. Restaurant with Southwestern, Route 66 and Coca-Cola decor. Specializing in Navajo frybreads and other Mexican dishes. Fantastic collection of all things Route 66! T-shirts, signs, upscale decor, books, hats -- the list is endless! Reproduction Sinclair gas station (our new Route 66 Song). Books, souvenirs and lots of memories. Rt.66 gift shop - 1942-79 Ford parts, specializing in trucks - general daily vehicle maintance parts - farm equipment parts. Overnight Lodging. Souvenirs. Open again after a 20 year hiatus... starting May 8, 2012. We are a specialty coffee house located on the historic downtown square in Carthage, MO. Just steps from the beautiful Jasper County Courthhouse, we serve espresso based beverages, smoothies and a selection of baked goods that varies daily. Wide variety of antiques, collectibles and flea market items sold in two-level shop with booths and seller cases. Powers Museum has case with Route 66 items as well as other dealers featuring signs and collectibles (especially postcards, ephemera, souvenirs, etc.) of the Mother Road in Jasper County MO and other locations along the route. Open daily Sun. - Sat. 10 am to 5 pm (except select holidays Easter, July 4, Thanksgiving, Christmas, New Years). Local history exhibit with rotating exhibits on Carthage and Missouri history with tourist info on Route 66 and the Jefferson Highway always available. Site includes reference library with 66 books/videos available for constulation and gift shop sells 66 souvenirs, postcards, books and other products along with other educational gifts/books for history lovers. Open normally spring through mid-December although this year's opening will be June 1. See www.powersmuseum.com for seasonal hours, program listings and special events. County Loop 122, Kafir Rd. We serve Salads,Sandwiches,& 7in. personal pan Pizza's. We always have feature entre's. We serve local Craft Beer & Wine. Great place to stay in Joplin, Missouri. In January 2005, local homeowners created a grassroots organization dedicated to promotion and historic preservation of Joplin's only recognized residential historic district � Murphysburg Residential Historic District. The area is designated from Sergeant Avenue from First Street to Seventh Street and Moffet Avenue. The historic district was home to Joplin�s wealthiest and most influential citizens during the late 19th and early 20th centuries. The Historic Murphysburg Preservation society has tirelessly supported the history, culture, and architectural design of this amazing neighborhood. To this end, the society has spent the last six years conducting holiday homes tours, gardens and walking tours, a street fair, turn of the century porch tours, sacred places tours, living history performances and architectural scavenger hunt. In addition, coordinated a holiday event "DickensFest" for the Joplin Convention Visitors Bureau and provided a guided walking tours for the several groups. Attendance at these amazing events range from 100 for walking and homes tours and 5,000 guests visited our DickensFest event. These tours and events encompass all age groups. Vintage Stock is an Entertainment Superstore, with new and pre-owned movies, music, video games, comic books, toys, sports memorabilia and more. 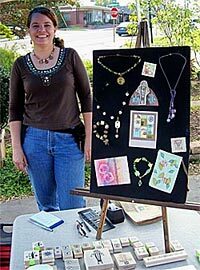 The online boutique offers handmade items including artwork, jewelry, books, greeting cards and other gifts. We also vend at local Midwest events. Features old and new recipes from Halltown MO located on Route 66 in Missouri. Our cover and back has photos locally taken both old & new plus historical trivia inside. These recipe books are on sale for $10 each which includes S/H in the USA. Creating original fine art and murals about The Mother Road for twenty-five years. At present, Mr. Harvey is the most viewed artist on Route 66. 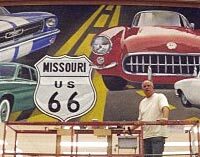 Ray Harvey Art can design and create a mural for your business or residence. Promote and advertise your business with the power of mural art. You can become a destination on Route 66. Missouri Wines and Meads (Wine From Honey). Enjoy a day in the country. Free Live Music Sundays May-October 2-6pm. Tasting Room and Gift Shop Open Year Round Tue-Sun 10am-6pm. Check website for Events and Festivals.